Matthew Barney is all over Artforum's annual "Best Of" issue, starting with an image from Guardian of the Veil on the cover (circled in red above). The next mention of Barney's work is in David Byrne's top 10 list of the best music of 2007. Byrne lists Jonathan Bepler's score for Barney's De Lama Lamina as #7 (even though the video was released in 2004, apparently Byrne didn't see it until 2007). Byrne writes, "Bepler realized the common but challenging ambition of making ordinary sounds, speech, and environmental noises into music." Barney receives two mentions in "The Artists' Artists" section, where Artforum asked a group of artists to list their favorite exhibitions of 2007. Tatzu Nishu selects All in the Present Must Be Transformed: Matthew Barney and Joseph Beus at the Deutsche Guggenheim, Berlin, "An amazing show that illuminated the commonalities between two artists of seemingly different styles and generations. Not merely the best exhibition of 2007 but the best I've seen in three years. I hope curators will emulate this approach, rather than recycle the same old themes. Be fresh, have a new point of view." Keith Tyson chooses Matthew Barney: Drawing Restraint at the Serpentine Gallery, London, "Bizarre props, tales of athletic endurance, and esoteric mythologies filled the building in Hyde Park to bursting. Like some nineteenth-century explorer returning from his adventures in exotic lands, the biomythical Barney is living his dream -- that of an interdisciplinary systems analyst with an expanded sense of potential for drawing, sculpture, and human identity." Finally, professor and critic Claire Bishop places "Matthew Barney's bull in Il Tempo del Postino" at the Opera House, Manchester, UK in her top 10. "At the end of an evening of otherwise patchy performance art by seventeen international artists, Barney, with a dog on his head, took command of the theater. Halfway through the enigmatic proceedings, a mythologically proportioned bull was led onto the stage and encouraged to enjoy sexual congress with a sculptural appendage fixed to the back of a Cadillac. The garlanded, golden-horned beast failed to rise to the occaision -- despite the presence of contortionists, balaclava-clad trumpeters, and ample quantities of Vaseline. I was left feeling ritually contaminated. Utterly inexplicable." 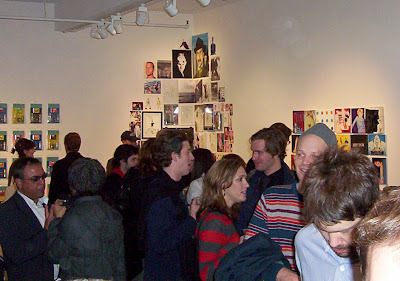 The Crowd at the Opening for "And, Who Are You?" Despite the cold weather, there was a huge turnout for the opening of "And, Who Are You? 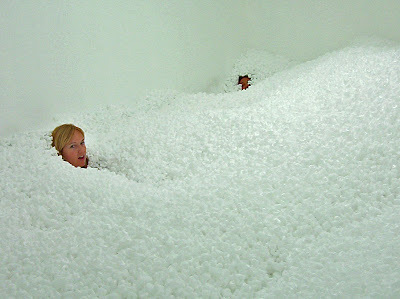 ", an exhibition of artists from Saatchi Online that features a Matthew Barney installation by CremasterFanatic.com founder Eric Doeringer. If you missed the opening, the exhibition continues through January 26 at Sara Tecchia Roma New York, 529 W 20th Street, 2nd Floor, New York City. "And, Who Are You?" is curated by Saatchi Online's Ana Finel Honigman and features art by Jay Batlle, Dilettante Films, Eric Doeringer, Bill Durgin, Fame Theory, Nora Klumpp, William Lemon III, Miranda Maher, Airyka Rockefeller, Eva Roovers, and Sara White Wilson. More photos from the opening are posted on Phillips Art Expert and James Kalm shot some video footage (Matthew Barney installation appears around 7:12). Possibly even more fun than the opening was the afterparty, hosted by artist Terrance Koh. A killer band played in the basement (didn't catch their name -- if anyone knows please leave a comment) while upstairs guests frolicked in Koh's room-sized installation of styrofoam peanuts. Probably the best party we've ever been to in New York! Matthew Barney, "Guardian of the Veil: Norman Mailer", 2007. Matthew Barney, "Guardian of the Veil: Sons of Horus", 2007. Matthew Barney, "Guardian of the Veil: The Adoration of Norman Mailer", 2007. 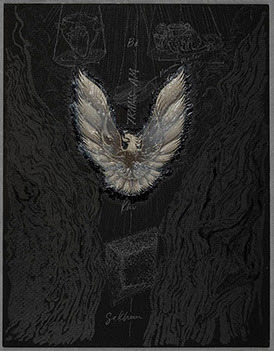 Matthew Barney, "Guardian of the Veil: Trans Am", 2007. 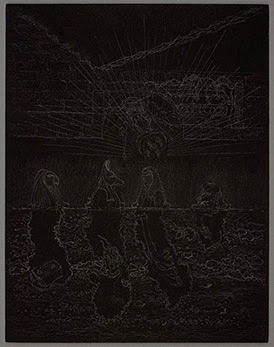 Matthew Barney is exhibiting a series of drawings from Guardian of the Veil (finally, an end to the confusion over whether the correct title is "Guardian" or "Guarding") and some photographs from Cremaster 3 at Regen Projects, 633 North Almont Drive, Los Angeles, CA, through January 19. 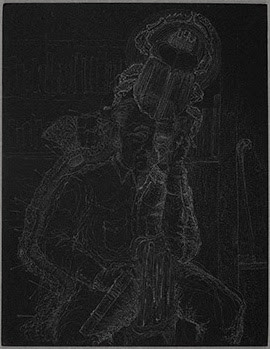 "Guardian of the Veil is the first in a series of performances Barney gave in his studio (Queens, NY) in April 2007 and then repeated in the Il Tempo del Postino exhibition in Manchester, England in July 2007. In this performance Barney used remnants from the Cremaster Cycle (principally Cremaster 3) combined with a new narrative based on elements from Norman Mailer's novel, Ancient Evenings. The Cremaster Cycle examines and follows a developing life from its inception to its inevitable end. In the Guardian of the Veil the narrative follows a protagonist who died in a fire and begins his journey through the seven stages of death toward eternal after-life. This examination of eternal life is in opposition to the trajectory of the Cremaster Cycle and sets up the conflict presented in Guardian of the Veil. 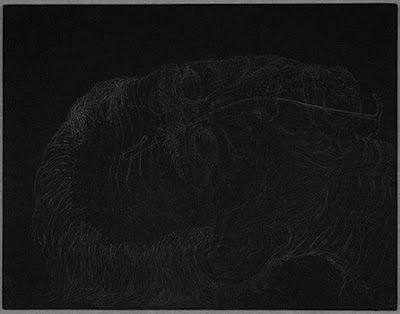 Drawn on black paper using graphite and petroleum jelly the drawings from Guardian of the Veil convey Barney's inimitable, almost surrealistic hand. As a vehicle for the narrative, the fantastical and exuberant drawings function as a story-telling device. In one drawing a decorated bull is seen mounting a Chrysler Imperial car buried in an Egyptian pyramid, seemingly its final resting place. Pictorially conflicting imagery of eternal life after death and the creation of life leading to its ultimate demise is apparent and at odds." Back on the East Coast, Barney also has a piece in the Mask exhibition at James Cohan Gallery, 533 W 26th Street, NYC, through January 26 (which, of course, is only six blocks from CremasterFanatic.com's Matthew Barney installation at Sara Tecchia Roma New York, 529 W 20th St, 2nd Floor). 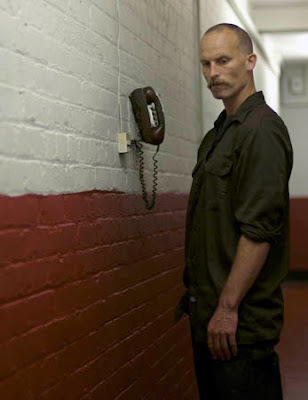 "On a Sunday afternoon in April, in a raw ground-floor cold-water loft 20 feet from the East River, Matthew Barney staged an extraordinary performance. A spellbound crowd watched him walk around slowly with a dog on his head; two half-naked women bent over backward in order to urinate in an arc, a marching band wore terrorist masks; a huge bull attempted to mate with a 1967 Chrysler. What made all this so great, in addition to Barney’s relentless attempt to plumb his own inner cathedral, was how homemade and speculative the whole thing was. 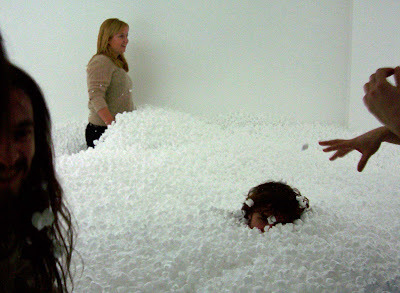 There were more art-student types there than art-world A-listers. Most important, it wasn’t an overproduced glamour event full of celebrities -- just an artist trying to figure something out in front of a grateful audience." First off, we apologize for going so long without posting. This has been a hectic month, we hope to do better in the new year. 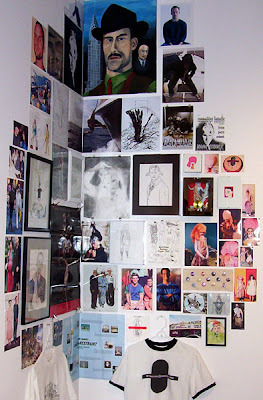 CremasterFanatic.com founder Eric Doeringer has created an installation of Matthew Barney photographs, collectibles, and fan art for the exhibition "And, Who Are You?" at Sara Tecchia, 529 West 20th Street, 2nd Floor, New York City. The exhibition runs from December 18 - January 26. We hope you will join us at the opening reception from 6 - 8 on December 18.